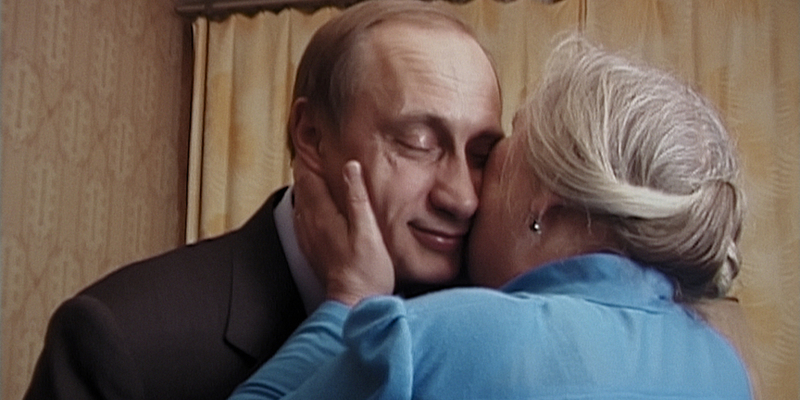 Vitaly Mansky, Putin’s Witnesses, 2018, DCP, color, sound, 102 minutes. THE ANNUAL FIRST LOOK SERIES at the Museum of the Moving Image provides an opportunity for adventurous New Yorkers to see international movies not likely to show up elsewhere. Among the must-sees in this year’s edition, which opens January 11, are three titles focused on Russian history, past and present. 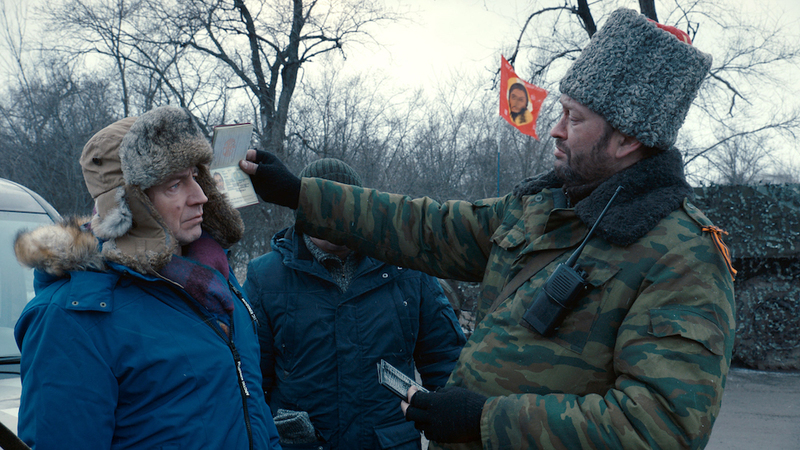 Sergei Loznitsa’s Donbass (2018), the opening-night feature, with the director present, is a somewhat absurdist rumination on the civil war that continues to plague Ukraine. Conflating contrived situations with newsreel-worthy facts in mosaic-like fashion, the movie is composed of long-take encounters between Ukrainians fighting for independence and Ukrainians favoring allegiance to Russia. Unless you’re up on current events, the in media res approach may make it difficult, at times, to discern who is who and what the issues are—especially since the “characters” change from episode to episode. Whether comic or violent in tenor, passions in all episodes run high and nerves are continually on edge. In one sequence, a wedding is celebrated by an assortment of cronies, including a cackling bride straight out of Rabelais’s cast of grotesques in Gargantua and Pantagruel. In another scene, a terrorist is tied to a pole and subjected to vicious beatings and insults by a vengeful mob of men and women. With such contrasts, the filmmaker sustains a balance between satirical clout and genuine disgust. While Donbass is “fictionalized,” it pushes the boundary between fiction and nonfiction, the latter of which is now a cross-dressing genre that does not appear to be waning. Lest we think this is a new breed, another work that fuses truth and fabrication is The Trial (2018), Loznitsa’s editing of restored footage from 1930, which is also being shown in the series. A prime example of Soviet propaganda produced in the heyday of the Stalinist regime, the footage is a record of one of Stalin’s show trials, an alternately riveting and numbingly predictable totalitarian sideshow. The very title of the film is a joke. We learn in the closing credits that the event it records was both fraudulent and damning. The organization on trial—the so-called Industrial Party, whose aim was, allegedly, to undermine Soviet economic and industrial policies in conspiracy with international forces—never existed; and the case against the individuals who allegedly belonged to this party was entirely fabricated. The whole thing was a spectacle of monstrous proportions, set, fittingly, in a theater and attended, presumably, by an audience of proles, and conducted with such calculated sobriety as to make the trial in Kafka’s novel seem to be Hollywood melodrama. Yet the defendants—all professional engineers and scientists deemed to be out of touch with the working class—were real and were condemned to years of imprisonment or death. To hear them refuse to defend themselves, confessing error and begging for mercy, is to witness the full, terrifying, and repugnant effect of Stalinist ideology. In the tradition of propagandistic cinema, the dour proceedings indoors are sporadically interrupted by footage of hysterical mobs marching in the streets and demanding death for the “imperialist betrayers” of the glorious working class on “trial” inside. Sergei Loznitsa, Donbass, 2018, DCP, color, sound 121 minutes. As its title suggests, Vitaly Mansky’s Putin’s Witnesses (2018) covers more recent history, and it is an ironic companion piece to The Trial. Mansky, who shot his film at the turn of this century, before and just after Vladimir Putin was elected, has revisited the intimate footage and added a narration, in which he speculates uneasily about a ruling style that threatens to return to policies from before the collapse of the Soviet Union. One of these is the revival of the Soviet national anthem, which Putin argued the people “needed” but which his predecessor, Boris Yeltsin, the first president of the Russian Federation, objected to. There is footage of Yeltsin celebrating the holidays with his family after resigning on December 31, 1999, leaving Putin as acting president before he was officially elected months later in 2000. We see Putin watching the election returns with anxious supporters, many of whom, as the narration informs us, were to oppose him less than a year later. Mansky’s doc is so low-key that it is easy to underestimate its value as a piece of Russian history and as a portrait of Putin before he became the powerful, controversial figure he is today. In one scene before his election, he visits and warmly embraces an old teacher; in another, he questions whether Mansky’s true feelings are in conflict with his own. In their final exchange, the filmmaker wonders if Putin is flirting with monarchy, to which the man replies, before walking off into the night with his dog, that he’s looking forward to a normal life after he’s done his job. Perhaps Mansky’s portrait of this enigmatic figure is the reason his movie, while in Russian, is a production of Latvia, Switzerland, and the Czech Republic. Claire Simon, Young Solitude, 2018, DCP, color, sound, 100 minutes. History and politics are not the only tracts that strain cinema’s alleged commitment to truth and credibility. If cinema verité was once seen as the touchstone of cinema’s true mission, the rapport between the camera and the human subject in the digital age has become so facile that it’s harder than ever to unquestioningly accept what people do or say. However earnest someone seems, the jaded viewer is apt to lapse into indifference. Claire Simon’s Young Solitude (2018), this year’s closing-night offering, is an affecting nonfiction collage of presumably unrehearsed intimate exchanges among teenagers in the Ivry-sur-Seine suburb of Paris: Think characters in an Éric Rohmer film looking back on their high school years. But while we understand Rohmer’s fictional creations as reflections of his worldview, we have no way of knowing just how forthright the young men and women in Simon’s documentary are, or how much they believe—or we should believe—what they say. This is less the film’s or the filmmaker’s or the participants’ “problem” as it is endemic to the social-media age, in which exposing intimate feelings before a camera is borderline banal. We understand the rules in the world of fiction, but few works of nonfiction entirely escape such nagging questions. While I found myself won over by the appealing youths in Simon’s film, I still wondered why, despite similar backstories of divorced or otherwise unavailable parents, there was hardly a coarse or embittered soul among them. Are they representative of the school they attend? Were they carefully screened? Were any foul slips of the tongue deleted? Or were they all simply on their best behavior? In Simon’s Récréations (1992), which is also being shown, the filmmaker does something similar with kindergartners, a group less inclined to suppress their primal impulses. Reservations aside, Simon’s work provokes us to sharpen our perceptions of all encounters, on-screen and off. The same can be said of Cille Hannibal’s heart-wrenching The Night We Fell (2018) and Rok Biček’s The Family (2017), the latter a dour but stubborn tribute to the human spirit. “First Look” runs from January 11 to January 21 at the Museum of the Moving Image in New York.